Join Protocol Partners-Washington Center for Protocol and The Etiquette Advocate for a comprehensive seminar on protocol, business etiquette and dining dynamics that will raise your protocol IQ; enhance your professional image and people skills; and teach you to greet and host guests with confidence, recognize and accommodate international customs and courtesies, build strong and effective business relationships, and move effortlessly from the conference room to the dining room in any environment or country in the world. Because 85% of success in business is based on people skills, demeanor and behavior toward others are as important as education and training, technical abilities and professional competence. Protocol and etiquette skills are required in order to represent yourself and your organization with poise and confidence. A lack of these skills can lead to insults, embarrassment, and distractions that prevent you from accomplishing your agenda and reaching your business goals. Successful professionals possess personal skills that make the difference in relationships: confidence, polish and poise, sensitivity to the expectations and cultures of others, and the ability to interpret nuances of customs, individuals, and situations that require special attention. The seminar includes hands-on exercises, case studies and an extensive seating workshop. The seminar is conducted by the Founding Partners of Protocol Partners-Washington Center for Protocol and guest subject-matter experts and includes instruction, a comprehensive workbook and other protocol resources; continental breakfasts; a buffet lunch with international protocol guest speaker (Wednesday); a four-course lunch with dining etiquette instruction and wine selection tutorial by guest wine expert (Thursday); and follow-up consultation with Protocol Partners. This seminar is designed for individuals who have protocol, events, or meetings and conferences coordination responsibilities; serve as gatekeepers for senior-level managers and officers; deal with international clients or colleagues; are entering the global marketplace; want to polish their professional image and people skills; are looking for an extra advantage in business; or whose duties in embassies, law firms, universities, corporate or non-profit offices, the military, local, state or U.S. government require a knowledge of protocol. April Guice, Former Senior Ceremonials Protocol Officer, U.S. Department of State, supported the official events program of the Secretary of State, the President and Vice President and other high-ranking U.S. government officials and, throughout her 25-year career, planned and implemented events involving chiefs of state, heads of government and other distinguished foreign dignitaries. Prior to her retirement in 2012, she served as the G8 and NATO Social Events Coordinator and the U.S. APEC 2011 Event and Venues Chief. She now consults for government and private sector clients and is an Associate of Protocol Partners-Washington Center for Protocol. How do your manners measure up when you dine for business or pleasure? Are you more focused on your utensils than on your dining companions or agenda? Join The Etiquette Advocate for a crash course that will polish your etiquette and people skills and make you confident and comfortable whenever you take your seat at a dining table with clients, colleagues or friends. Dining Decoded is a passport to painless and productive dining experiences. Not ready for prime-time dining with your boss, a client or the parents of your significant other? Have doubts about your ability to meet and greet guests, make introductions, or handle a sticky social situation? Then you need a MANNERS MAKEOVER! Through demonstration and in-class exercises, you will learn: etiquette skills to increase your social aptitude and business savvy, introductions and a proper handshake, conversation skills, telephone and electronic etiquette tips, networking pitfalls, dining and entertaining do’s and don’ts, and the top twelve etiquette mistakes. 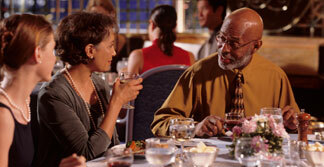 Discover the power of modern manners in a fun and comfortable environment. Join The Etiquette Advocate for an enjoyable evening of etiquette instruction, fine food and wine. Polish your dining etiquette and people skills and exhibit a new level of confidence at your next social or business gathering. Tuition includes instruction and demonstration, 4-course dinner with wine presentation and pairings, and seminar workbook. Topics include: Professional image; greetings, handshake and introductions; business card exchange; dos and taboos of business hospitality; host/guest responsibilities; table etiquette; place settings; American and Continental styles of dining; eating difficult foods; toasts; tipping; and gift guidelines. Tuition includes seminar instruction, four-course lunch or dinner, and seminar workbook and bibliography. Topics include: Preparing for success; people skills; greetings, handshake and introductions; interview etiquette; office and meetings etiquette; electronic etiquette; party protocol; host/guest responsibilities; receiving line protocol; dining etiquette; speeches and toasts; and gift guidelines. In collaboration, The Etiquette Advocate and Protocol Partners-Washington Center for Protocol, Inc. will offer a series of seminars on international protocol and business etiquette. The presentations will cover basic social and business etiquette and the protocol requirements of traveling to and conducting business in selected countries and regions. Presented by two instructors and a guest speaker, the seminars will include information on appropriate greetings, handshake and introductions; business card exchange; appointments and meetings protocol; negotiating techniques; telephone and electronic etiquette; host and guest responsibilities; dining decorum; and an overview of the culture and custom of the highlighted country or region. Included in the seminar tuition are an illustrated seminar workbook, a textbook and a four-course meal with dining tutorial. Please check again for course dates and locations. Please check again for course dates and locations or contact The Etiquette Advocate to offer an etiquette evening or activity for the members of your organization. Contact The Etiquette Advocate to discuss tailored training for yourself or your company or organization.